I had to show you what is pretty common in Texas. This is a lawn on my daughter's street. That's right. All my fellow Texans know what I'm saying is true. The rest of you will want to notify someone about my mental state...but it's the wrong state...we're gonna talk about the State of Texas. 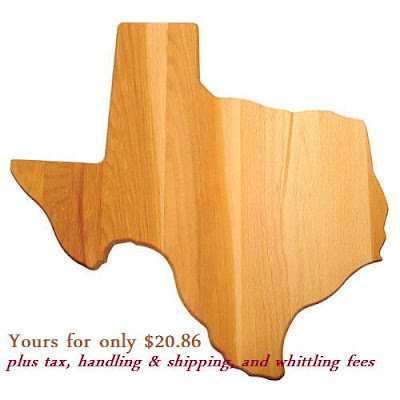 When I moved here from Southern California, no one could have prepared me for the reverence paid to the shape of Texas. I have a feeling I wasn't just a clueless Californian, I think most non-Texans would react the same way. It's not just Christmas lights! Here's a book about it. And address stones.... How about a waffle maker? 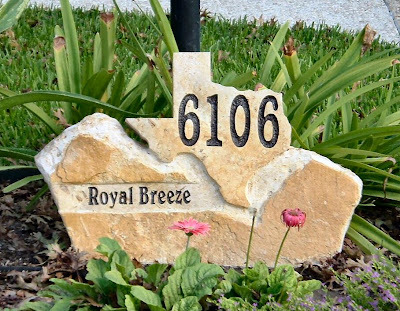 You name it and Texans want it....shaped like the Lone Star State or the State flag. Do you need a new cutting board? l've never see stuff like this in CA. 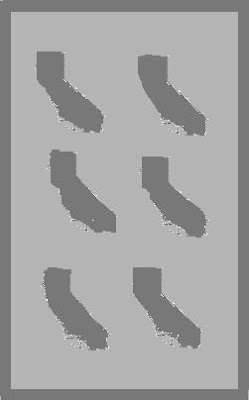 You know, shaped like the State. But hold on. 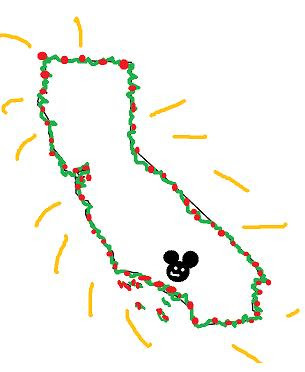 I can't let this Christmas pass us by without making an effort to please my friends in California. 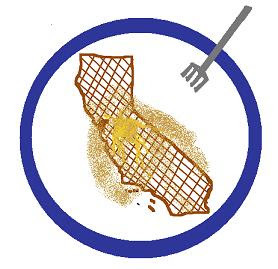 this was a big effort, California friends....even though the shape of The Golden State is not a popular symbol. How about Florida? Colorado? Arizona? Virginia? Anyone? 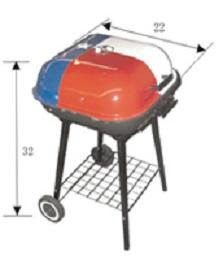 **Gift suggestion #6 has been added below this post. Check it out. By the way, Pooper has a marshmallow blower gun. A doctor gave it to him when he was in the hospital...during a time when he was practically living in the hospital, feeding tube days.... Im still paying the price for all the spoiling he got! I love the marshmallow gun, who would have come up with a missle that uses sweet sticky food? clever, I say. 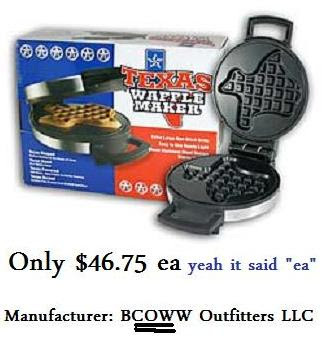 I noticed this too when we moved to TX. They are very proud. We do have stuff in the shape of Florida, but it is usually only tourist stuff....like a nice florida spooon rests. who does not need one of those. Very clever observations Grandma J.
I'll take muffins and waffles the size of Virginia. Oh wait. You were talking shape. 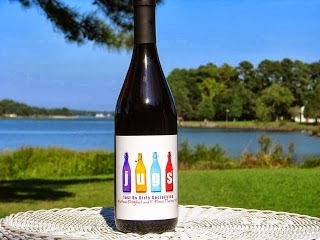 Things that are "Made in Virginia" are very popular, but SHAPED like VA? Not so much. We prefer things shaped like pineapples:) Good old southern hospitality! You gotta love Texas! 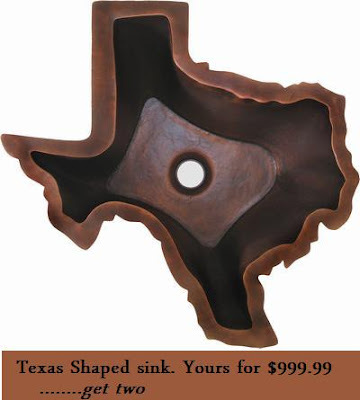 I am liking the Texas-shaped sink. I've been in a Texas shaped jacuzzi before. We really are nuts here! That's so true about Texas. You gotta love it! Be careful with that marshmellow gun. My mom bought Dalton one at a craft fair thinking "it's marshmellows; it can't hurt". Well, it doesn't hurt unless your kid hits you directly in the eye with one! Wait. WHAT? Did Cortney say she had been in a Texas-shaped jacuzzi?? You're kidding, right? Bwahahahaha! I've seen muffins in the shape of Tennessee. We bought marshmallow guns for all the boy nephews a couple of years ago. I think all the big boys had more fun than the ones the gifts were intended for! This is so true! And don't forget the stars all over the place! 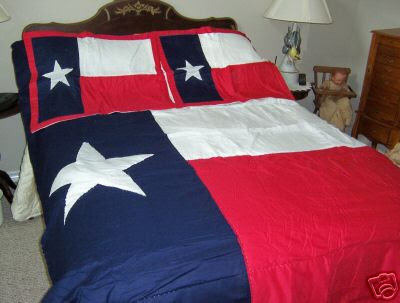 We're looking for a home in Utah and we saw a house with the master bedroom decorated in the Texas theme! In Utah! I bet their home was for sale because they're going back to the lone star state! Ahhh, Texas. Home of the Cowboys! 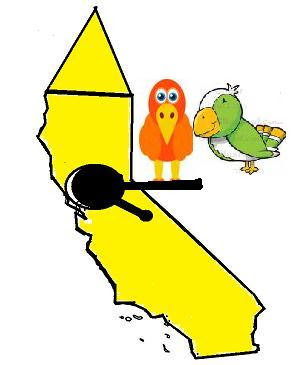 I am lovin the Californian bird house. Nutty is right! Colorado is a beautiful and scenic state- we don't don't need to accessorize it. Marshmallow guns? Sounds like it could get you into a sticky situation. When I lived in Texas we lived in an apartment complex that had a "Texas shaped" pool with a fountain in the middle where our city was located. I've also seen pasta that was Texas shaped. 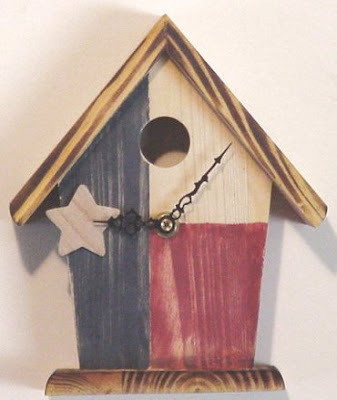 I love the California shaped birdhouse. I'll take 50, please. This is SO funny. I have a friend who lived there for a short time while her husband was in the army. I think she has 3 cross stitched pictures of Texas in her house still : ). We don't do anything like that in Pennsylvania. don't forget the texas flag shower curtain with texas shaped hooks! Biddy! That is hilarious! I realized I missed so many things that non-Texans wouldn't believe. 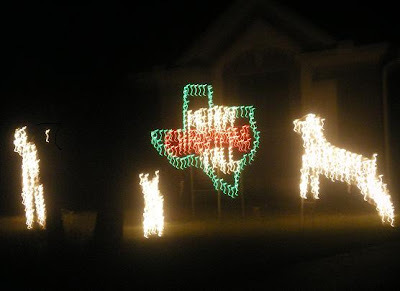 You need to post pictures of your grandmother's lawn decor..especfially the longhorn...up close! I've seen new homes with the shape of Texas etched in their driveway, and most homes have the Lone Star out of metal hanging somewhere prominent on the front of their home. Tonight I was in Bed Bath and Beyond...a national chain store...but lo an behold I spotted the coveted shower curtain that Biddy has. They have a whole kitchen section with Texas stuff...towels with the flag, star, or state map. Place mats, and one of those free standing paper towel holders with a bronze star on top.